Kober. The best products and the right advice. WeatherPro® introduces a new era in convenient, free-choice mineral and vitamin supplements. Based on a highly-weatherproof and palatable ‘loose lick’ format. 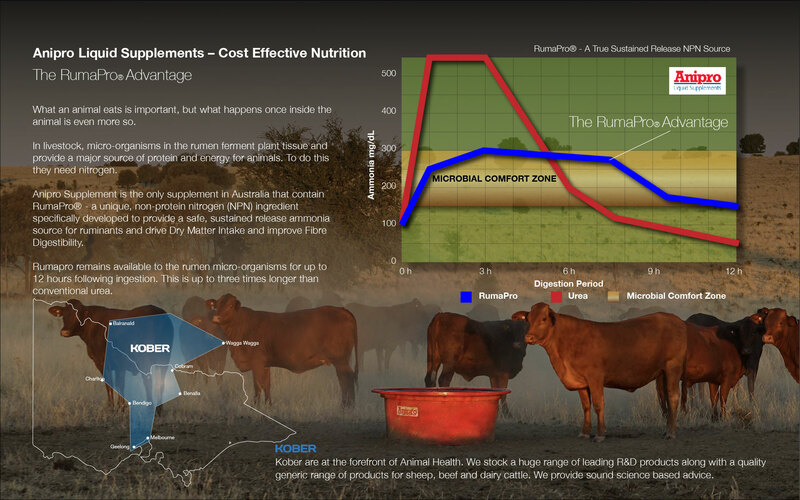 Call Kober to find out more about how WeatherPro® can increase your sheep & cattle productivity. Anipro Prelac is a palatable liquid lead feed that provides anionic salts, HCI, essential vitamins and minerals for the dairy cow during the transition phase. FibrePro™ is a highly weatherproof protein, mineral and vitamin supplement for all classes of sheep, beef and dairy cattle. FibrePro improves feed utilization. Anipro Liquid supplement maximizes feed utilization, maintains & increases liveweight, enhances reproductive performance and optimises immune function in your livestock. Anipro® for Sheep is designed to provide protein (as non-protein nitrogen), minerals and vitamins to sheep grazing pasture or crop in a safe and cost effective manner. Kober stock and can supply a range of additional Animal Nutritional Supplements from lick blocks to feed additives. Contact us to discuss your special requirements. Contact Roger Wakefield for more information on supplements and nutrition.